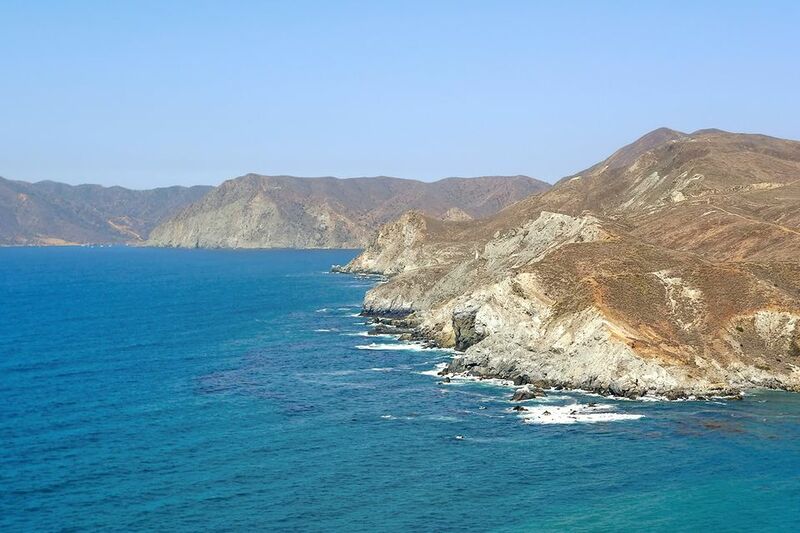 If you want to get into Catalina Island, hiking or walking is the way to do it. You can take a walk around town, a day hike or even a multi-day trip on the Trans-Catalina Trail. You don't need a permit to walk around town, but if you're going anywhere else, you do. Day hike permits are free and available from the Catalina Conservancy at 125 Claressa Avenue. You can get a trail map there, at the interpretive center on the way to the botanical garden or at the airport. You probably already know the admonition to take plenty of water, sunscreen, and snacks on any hike. I can tell you from experience that you'll likely need more of all three than you think. You can find the routes for each of these hikes on Google maps. I wish each one could be in a different color, but the Google tool doesn't allow that. All of the routes end at Big Olaf's Ice Cream. I figure you'll want a treat by the time you get back to town. This hike is my favorite route through town. You can follow it using a map or your mobile device. Before you Get Started: What was supposed to be a "temporary" closure banning pedestrians past Lover's Rock had been in effect for years when I last visited. If the road is still closed, take a detour through town to get to the Inn on Mt. Ada. Then go back to town on the same route. You can start your hike anywhere along the waterfront, but the Casino Building is an easy place to find. Your walk will take along the waterfront through town. Look for the spunky orange garibaldi fish that hang out around the rocks in the marina. You might also see a sea lion trying to stow away on a sailboat. Past Lover's Rock and Pebbly Beach, you'll go uphill for the best view in town, passing the Inn on Mt. Ada which is the former home of Wrigley Chewing Gum founder William Wrigley. On the way back down the hill, you'll pass the charming local pet cemetery. In town, you can take any street back to the waterfront. Or you can take a side trip up Chimes Tower Road. Western writer Zane Grey once made his home in the large, pueblo-style building across from the chimes tower. It was a hotel for many years, but it is currently closed to the public. You can see it from the outside and enjoy the island's second-best view before walking back down into town. It's about 1.2 miles up Avalon Canyon Road to the Botanical Garden on Avalon Canyon Road. You'll pass the golf course and abandoned aviary on the way. You can tour the garden and take in the view from the Wrigley Memorial and then walk back to town. But — If you have the energy and fitness level, don't stop. Walk up the steep uphill trail that starts on the right side of the memorial. It leads to the island's backbone, with expansive views in all directions at the top of the hill. After that, you can go back down the way you came or keep hiking along the mountains' backbone to connect with Stagecoach Road which will take you back to town. My favorite Catalina Island hike goes from the Airport in the Sky to downtown Avalon. It's about nine miles via the most direct route or 11 miles with a detour. The paved road descends from the island's crest (1,600 feet) into Avalon. It rises and falls over tawny hills, past Mt. Blackjack and cliffs plunging into the ocean. It's easier to go downhill than up, so do what I do: Call 310-510-0143 one day ahead to reserve a space on the airport shuttle. Let them do the climbing and hike back to town. You can get a cup of coffee or breakfast at the Airport in the Sky and then browse the natural history exhibits outside before starting your hike. The route is easy. Just follow the paved road back toward town. You're likely to find some of the island's resident bison along the way. They are descendants of balky ancestors who refused to get back on the boat after appearing in a 1920s film. The shaggy beasts snort and grunt around muddy water holes, eyeing visitors as they pass, their tails flicking. Don't forget that they're wild creatures who could hurt you if alarmed. Every turn presents a new vista, alternating between grassy hills and coastal panoramas. The paved road makes it easy to walk without worrying about footing, and there's plenty of time to daydream. White-rimmed waves lap on Willow Cove's sandy beaches, and breakers splash on Frog Rock. With no traffic, people or electrical hum, your ears adjust to nature's sounds: bird calls and rustling grass. For a longer hike, turn right just past the Wrigley Reservoir and follow the ridgeline. In about two miles, you'll reach a trail that descends into the Botanical Garden. This detour will add a little more than 2 miles to your trip and is described above. Otherwise, stay on the paved road toward town. Civilization's hubbub returns when the road reaches Zane Grey's Pueblo and the bell chime tower at Avalon's edge. For hardy hikers and bikers only, the 37-mile Trans-Catalina Trail follows the backbone of the island from end to end.